The Easiest Way to Get the Best Prices Available. Period. Simplicity, visibility, and immediacy. It’s why our Spot Market is the industry’s only trading exchange for bulk dairy commodities. 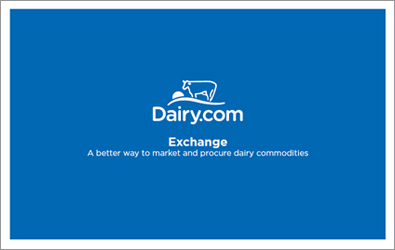 Trading perishable dairy commodities in a volatile market environment requires a secure, online exchange that’s easy to use, cost-effective, and always accessible. Dairy trading professionals have found just that place at Dairy.com since 2001. For more than 15 years, Dairy.com has hosted trading for the industry’s major buyers and sellers of cream and condensed skim. Our trading exchange operates in real-time; matching logic assists traders in finding the best deals within the time constraints of highly perishable commodities. Find the best supply or demand of bulk dairy commodities available anywhere by tapping into our secure, online community. Setup takes less than 20 minutes, with instantaneous supply or demand posting. Matching takes place in real-time and an intuitive interface makes it simple to negotiate deals. Competitive pricing and market insight, including a proprietary cream index and historical dairy trading information, provides a competitive edge at an affordable price. Take advantage of integrated scheduling, long-term contract management, and logistics tools for determining net-landed cost and net-landed revenue. Everything you need to know about the Exchange suite in about 5 minutes. Available now for instant download.